It's the beginning of a new year and I've ignored my little blog for too long. So while combing through my recent purchases, I felt like I needed to post something special – something you don't see everyday. I hope this Babe Ruth fits the bill. This is the only "baseball card" in the 1952 Look 'n See set. 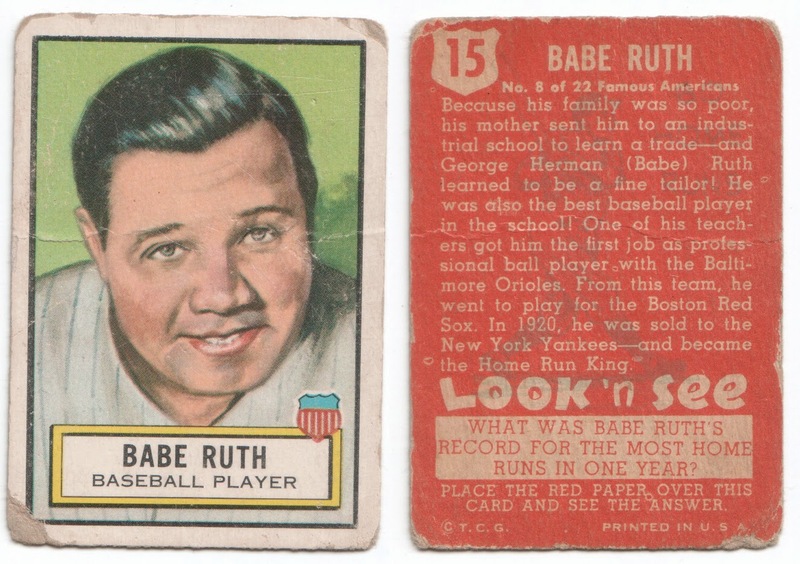 Though Ruth may be the most popular card of the 135-cards made of famous figures, it's not the most valuable. That honor goes to the Dutch painter Rembrandt. Go figure. Rembrandt: no thanks; Babe Ruth: awesome. As a collector of poor old baseball cards, I've recently read several articles on how baseball cards are worthless. The reference was to all those cards made in the 1990s. You know, the ones that are probably in the back of your friends' closets. The ones that were supposed to fund college educations and retirements. They didn't, they won't. The truth: they are worthless. I got rid of mine years ago at a garage sale for pennies. They're not worth the space they take up in your home. But the cards that do hold their value are those old cards (pre-1980 in my opinion) that your mother threw away. The ones your dad and granddad had before they met their demise in the local landfill. Supply and demand: There are far fewer of these cards than the glut of those cards in the 1980-90s. Did mom or grandma help diminish supplies by dumping them? Probably. Did that contribute to their worth? Maybe. But so did the carefree attitude we had for them: Rubber bands, thumbtacks and backs of jean pockets. Sometimes I wonder what people think when I tell them I collect baseball cards. I wonder if they think I have stacks of cards in boxes in my closet waiting to fund my retirement. The answer is, I do. But its not the cards they're thinking of. No Derek Jeters. No Clayton Kershaws. Nothing newer than 1980. My cards look more like the one above. Poor. Old. And hopefully, not worthless.